(Okayama, 11 March) Researchers at Okayama demonstrate the promise of a new approach for stimulating neurons in the eyes of patients with dead photoreceptor cells. “The basic concept of retinal prostheses is to replace dead photoreceptor cells with artificial devices,” explain in a review of their recent research Toshihiko Matsuo, eye doctor, and Tetsuya Uchida, polymer scientist, from Okayama University, in collaboration with Kenichi Takarabe, semiconductor scientist, from Okayama University of Science in Japan. Blind patients with hereditary diseases such as retinitis pigmentosa, have dead photoreceptor cells but other neurons remain alive. The Okayama University researchers are exploiting the working functions of these living neurons to send messages to the brain by artificial stimulation from photoelectric dyes that respond to light. Other work on retinal prostheses has focused on the use of arrays of electrodes – as in a digital camera – or photodiodes. The challenges with these approaches include miniaturising the devices, biocompatibility, low sensitivity and low currents which often demand an external power source. “The prototype of the photoelectric dye-coupled retinal prosthesis, OURePTM, is unique in using electric potentials to stimulate retinal neurons, in contrast with the other systems of retinal prostheses that generate electric currents,” ” say the Okayama University researchers. Kelvin probe studies confirmed the presence of electric potentials on the film surface induced in rapid response to light. The researchers also tested the effect of the dye in the eyes of Royal College of Surgeons rats. Cytotoxicity analyses proved promising and behavioural tests on the rats suggested that the treatment was effective. The Okayama researchers used the dye 2-[2-[4-[dibutylamino)phenyl]ethenyl]-3-carboxymethylbenzothiazolium bromide ,which has an absorption spectra that spans the visible range from 400 nm to 600 nm. It is also stable, readily synthesised and has a low molecular weight and no obvious toxic components. They coupled the photoelectric dye to a soft thin polyethylene film at a concentration of around 106 dye molecules per μm2. The film could also be rolled up before inserting into the subretinal area through a small opening so that a large film could be fitted providing a large field of view. Polyethylene has been used for medical implants for some time and its safety and stability has already been proved. The researchers tested the toxicity of the dye in vitro using cultured retinal cells, as these are the cells the dye would come into contact with first. No cytotoxicity was observed. Furthermore, no toxicity has been found for OURePTM or for the photoelectric dye in any tests for biological evaluation of medical devices, based on the International Organization for Standardization (ISO) 10993. The photoelectric dye coupled polyethylene film was then implanted into the retina of living rats. Apoptosis was reduced in the retinal neurons which were in contact with dye-coupled polyethylene film, OURePTM. The photoelectric dye may have a neuroprotective effect on retinal neurons. Further tests are needed. Kelvin probe measurements of the electric potential on the dye-coupled film surface when exposed to light showed rapid responses over the same range of wavelengths as the known absorption spectrum of the dye. The sensitivity to different light intensities was also promising. The researchers tested the dye on chick embryo retinal cells in vitro using a fluorescent dye to monitor calcium ions. They found that the dye-stimulated responses triggered the increased calcium ion concentrations. Dye coupled films were also implanted into Royal College of Surgeons rats, who were then subjected to behaviour tests. When the rats were placed in a drum with spinning walls painted in white and black vertical stripes, the rats moved in the direction of the rotating stripes, suggesting some level of sight had been retrieved. Matsuo T, Uchida T, Takarabe K. Safety, efficacy, and quality control of a photoelectric dye-based retinal prosthesis (Okayama University-type retinal prosthesis) as a medical device. J Artif Organs 2009;12:213-225. Alamusi, Matsuo T, Hosoya O, Tsutsui KM, Uchida T. Behavior tests and immunohistochemical retinal response analyses in RCS rats with subretinal implantation of Okayama-University-type retinal prosthesis. J Artif Organs. 2013 Sep;16(3):343-51. Alamusi, Matsuo T, Hosoya O, Tsutsui KM, Uchida T. Vision maintenance and retinal apoptosis reduction in RCS rats with Okayama University-type retinal prosthesis (OURePTM) implantation. J Artif Organs. 2015. Photoelectric dye-coupled thin film as a novel type of retinal prosthesis. Okayama Univ. e-Bulletin Vol.8, September 2014. Behaviour test to establish the presence of sight in Royal College of Surgeons rats with retinal prosthesis implantation. The researchers rotated a drum with black-and-white vertical stripes either clockwise or anticlockwise at a slow speed of 2 or 4 rpm. A rat that had prosthetic retinal implants was put in a round transparent-walled cage inside the drum. 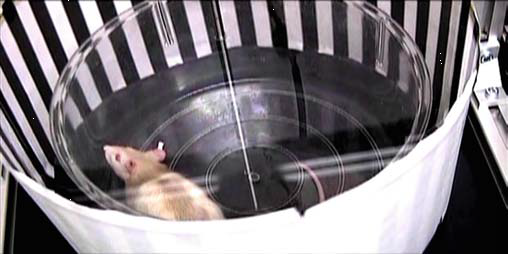 Instances when the rat turned its head in a direction consistent with the direction of drum rotation were counted as indications that the rat had retrieved some level of sight. Associate Professor Toshihiko Matsuo, M.D., Ph.D.
Okayama University is one of the largestcomprehensive universities in Japan with roots going back to the Medical Training Place sponsored by the Lord of Okayama and established in 1870. Now with 1,300 faculty and 14,000 students, the University offers courses in specialties ranging from medicine and pharmacy to humanities and physical sciences. Okayama University is located in the heart of Japan approximately 3 hours west of Tokyo by Shinkansen.